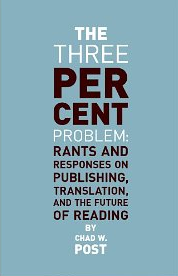 Our friend and colleague Chad Post writes today to let everyone know that The Three Percent Problem: Rants and Responses on Publishing, Translation, and the Future of Reading is now available. The book is a collection of “best of” pieces from the Open Letter Books’ Three Percent blog. For practical purposes, we’re only offering this as an e-book for the time being, at the very low price of $2.99. And as mentioned above, all of the proceeds from the sales of this book will go to paying our translators. . . . So you should buy two copies. Actually, what I’d like for all of you to do is to buy a copy on Friday, September 16th at noon. Yes, I want to game Amazon’s ranking system and see if we can spawn some extra sales simply by inflating our position on the best-seller list. So, if you’re interested in supporting translators, or want something fun to read, or just want to see what happens when there’s a mad rush for a particular e-book, buy a copy for yourself and tell all your friends to do the same. Read the full announcement on Three Percent.